1 of 2 Heat oven to 325 degrees F. Coat both sides of flour tortillas with cooking spray. Sprinkle both sides generously with cinnamon-sugar. Cut each tortilla into 4 wedges. Line baking sheet with aluminum foil. Place tortilla wedges on foil. Bake in 325 degree F oven about 20 minutes or until crisp, turning wedges over halfway through baking. 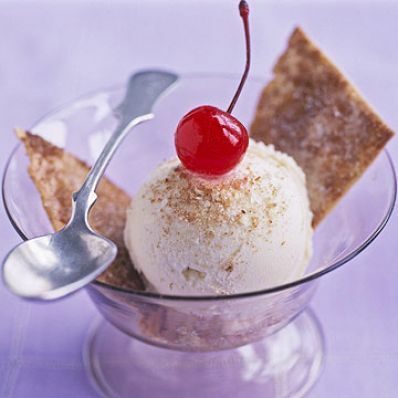 2 of 2 To serve, spoon 1/2 cup low-fat vanilla ice cream into each of 6 serving dishes. Finely crush half of tortilla crisps; sprinkle over ice cream. Serve each with 2 additional crisps and cherry on top. Makes 6 servings. Per Serving: 1 g fiber, 5 mg chol., 157 mg sodium, 4 g Fat, total, 1 g sat. fat, 32 g carb., 5 g pro., 178 kcal cal.